The Day I Demanded God Show Up. Not too long ago, I was going through a hard season. When I re-read my journal from then or think back on it, my chest gets tight and sometimes tears still come to my eyes. During that time I was lost, confused and I distinctly remember the moment I felt like my spirit just broke. I had no idea what to do with myself. My journal specifically says, "I am a shadow of myself. I am a puddle of a person that has no shape, no direction and people are just walking over me and looking right through me." The feelings were deep, raw and heavy. One morning when I woke up, I just couldn't do it anymore. You know when things aren't right in your world and you have those couple of seconds when you wake up and you feel okay...until reality comes crashing in. I was over that being my story every single morning. I remember laying in my bed and saying something like this to God, "I know you're there. I know you've been there this whole time. But I need to SEE you. I need to see SOMETHING that makes sense. You may be present, but you're definitely not making that presence known. Show up in my room, write something in the sky, have a random person stop me in the street to give me a message, it can be crazy, I don't care what it is, but I NEED an answer or something, anything." Demanding, I know. I was desperate. Writing that down gave me a little twinge of "You maybe shouldn't speak to God that way", but a long time ago I gave up on the idea that there's a right way to talk to God. God can handle our demands, our anger, our sorrow and whatever else we say or feel. After I made my demands and God said, I do not negotiate with terrorists...I went on with my day. Later that day I graciously received a response. It happened through the most random circumstance, but when it did, I just knew what it was. It wasn't anything flashy. It was more like a whisper across my soul. I didn't understand it at first because surely, this could not be the right answer. I don't know about you, but that's usually how God talks to me. In whispers. That day expressing myself, making my demands and then moving on gave space for me to hear those whispers. He whispered across my soul and it stopped me in my tracks. Peace filled my whole self and it was such a contradiction to what I had been feeling, I knew it was God giving me an answer. I don't know how to explain it except that I felt lighter and free. So I did what any normal person would do, I thought, "No...that's not really what I meant when I said I needed an answer." I told a few close friends about it, confident that they would say you're right that's not the answer. They didn't. Thank you Jesus for wise family and friends. When you know God is telling you something (especially when you were demanding it in the first place) and then the people who know you best confirm it, you should probably listen. Acting upon that whisper that I heard wasn't easy. It was actually one of the hardest things I've ever done, but it was right. It actually didn't make a lot of sense from the outside looking in, but it was the next right thing for me. I think that's what we need to realize more in life. Sometimes what we need to do is just the next right thing. There was a lot of unknowns and confusion in my life, but all I knew was the next right thing. I kept that as my motto during that time. Just the next right thing. Okay, now the next. Your next right thing may not fit with your life plan or what you thought your life would look like. It may not make sense, it may be hard, but if it's right, it's right. To me, God shows up in whispers and through the wisdom of my friends and family. Sometimes it takes being broken, being a shadow of yourself and having the boldness to just express what you need to fully understand and see what God wants you to see. For you to see the next right thing. We have to create the space so we can see. So we can hear. We have to have the willingness to be bold and to trust that while our next step may not make sense, if it's the next right thing, it's the right thing. 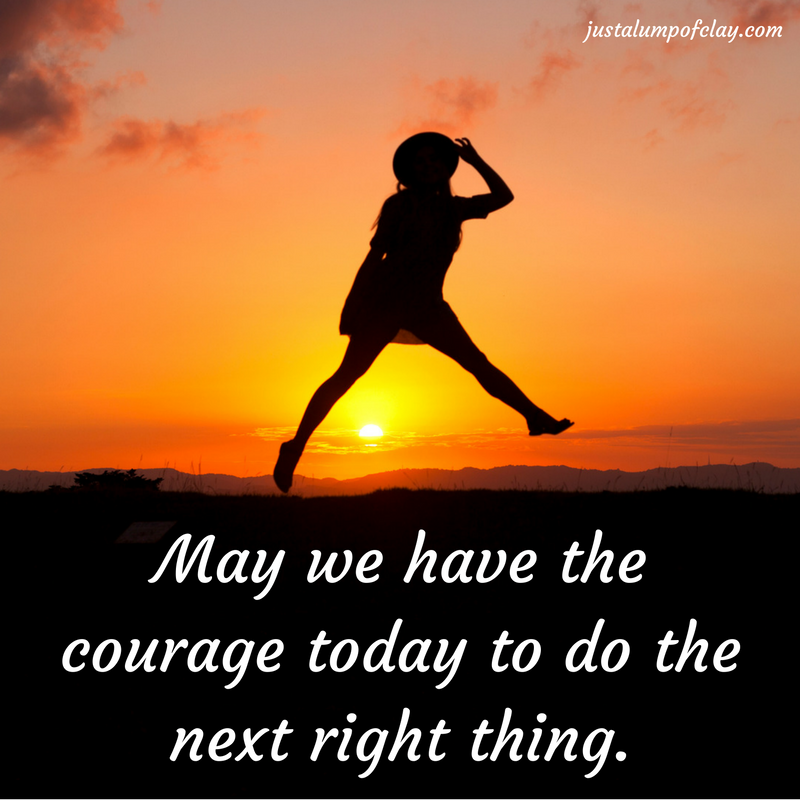 May you have the courage today to do the next right thing for you. May you make space for the whispers. May you open your eyes to what God intends for you to see. May you have the boldness to speak to God about how you really feel. May you let go of what you need to let go of so that you can grab what's next. May you find peace in your searching. May you find relief from your burdens. May you find light among your shadows. May you remember and trust that God will show up. Sign up below to receive posts straight to your inbox and to sign up for my secret monthly posts. You'll be the first to hear updates, new retreat dates and a monthly dose of encouragement. Newer PostWhat Anxiety Feels Like To Me. Older PostWe Can't Turn Away.